The fourth-annual Fayette County Toast to Summer & Hot Air Balloon Glow was held on Saturday with a large crowd joining for the day-long event. Isaac Butler jumped into a hot air balloon basket for a quick photo while the members of the Central Ohio Balloon Club show him the flight equipment. The fourth-annual Toast to Summer attracted about 5,000 total visitors from across Fayette County, from neighboring counties, and from multiple states, according to Jolinda Van Dyke, executive director of the Fayette County Travel & Tourism Bureau. The event, which was held at the Fayette County Airport, featured a myriad of activities for visitors of all ages. Some popular attractions included the beer garden and wine tastings, live music, a hot air balloon glow, and fireworks. Van Dyke said the Toast was a “group effort” that involved the Fayette County Chamber of Commerce, the Fayette County Pilots and Friends Association, the Fayette County Travel and Tourism Bureau, and many other local groups, businesses and individuals. https://www.recordherald.com/wp-content/uploads/sites/27/2018/06/web1_20180623_175102-1.jpgThe fourth-annual Fayette County Toast to Summer & Hot Air Balloon Glow was held on Saturday with a large crowd joining for the day-long event. 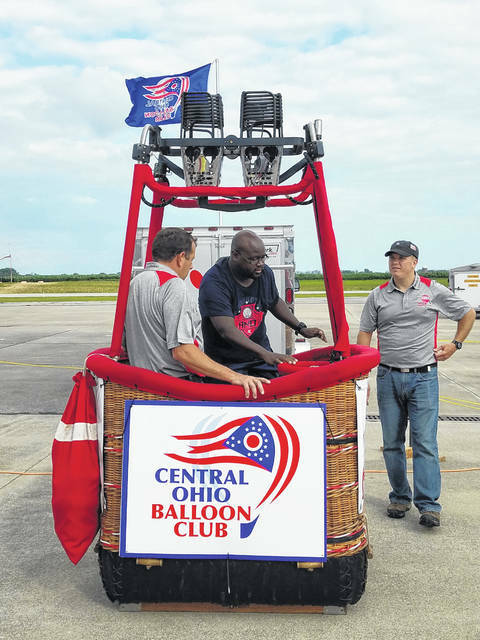 Isaac Butler jumped into a hot air balloon basket for a quick photo while the members of the Central Ohio Balloon Club show him the flight equipment.